It was an encouraging year for Email Marketing. In the 2014 edition of our North American Email Marketing Trends Report we saw Email metrics improve across the board. But email marketing results can still improve. What are the 4 major factors we see impacting email marketing this year? Email is strong because email marketers have become more disciplined in their approach through constant testing and optimization. Average Open Rates improved to 24.3% up from 22.0% and Click-through Rates increased to 6.0% from the 5.8% last year. We’ve seen more email marketers optimize their messaging for mobile devices which has helped to increase engagement metrics. Still there is room for improvement, email marketers should continue to refine their approach to list hygiene and adherence to industry best practices. What are the 4 major factors we see impacting email marketing? In Q4 2013 over 55% of all email opens occurred on mobile devices (i.e. smartphones or tablets). As a result, Email marketers should shift their strategies and tactics to be mobile friendly and adapt to a “mobile-first” mentality. It’s much easier to adjust a mobile email to a desktop than it is to do the opposite. More email marketers made these adjustments in 2013. Providing a positive user experience is a critical factor in gaining and keeping your subscribers attention. Email marketers must consider the full experience from the email design, copy, subject line, and call to action through to landing pages and web forms. In 2014 it will be important for marketers to optimize their messaging so that subscribers can view and interact with their email messaging using their preferred device (i.e., smartphone, tablet, desktop). This is a difficult task as, according to Ipsos-Reid, the average Canadian subscribes to 13 commercial email programs. As a result, marketers are in a constant battle for customer attention and face a tough task in keeping their current subscribers active and engaged. Most marketers understand these pressures all too well, but still give in to their strains from time to time by trying to accomplish too much with too few resources. Instead a marketer should decide early on what their goals are and how they’re going to be achieved. Disruptions are inevitable but having a good plan to reference will ensure that you remain on task. 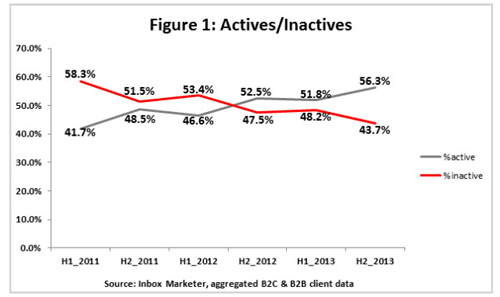 “Inactives” are valid email subscribers who have not opened or clicked in the last six months. Subscriber fatigue can become a problem if your sending frequency is too high and if you are sending messages that are not relevant. Those Inactives can have a negative impact on your overall email metrics, but they also represent a segment rich with potential revenue. Email marketers need to design campaigns targeted at these Inactives, focusing on reactivating and engaging email subscribers again. You can also look at it from the other side and prevent further list fatigue: It is important to be selective and to only send messages if you are certain that the e-mail is relevant to the subscribers that will receive them. In 2013, there were several reported data breaches at large U.S. companies, as well as data practices at both Google and Facebook are also under scrutiny. As a result of this increased concern in consumer privacy, Industry Associations are trying to be proactive by establishing more stringent guidelines for email practices. One such example is Canada’s Anti-Spam Legislation (CASL) which comes into force on July 1, 2014 and targets spammers, ensuring that email best practices are followed. For those interested in a more detailed analysis of the latest email metrics, trends and challenges a download of our free North American Email Trends Report here. Use it to benchmark your metrics and it has adigital messaging best practices. TJ is a digital marketing professional with 10+ years of experience in Marketing, Sales, Client Services, Production and Graphics on both client and agency side. His current role has him managing all marketing activities for Inbox Marketer, a leading digital messaging firm out of Toronto, Canada.